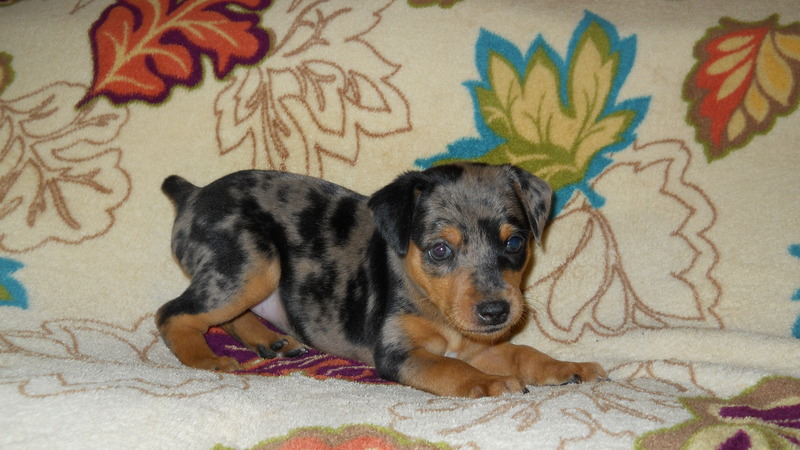 There are several unethical dog Breeders claiming to have Harlequin Pinschers. Know the facts BEFORE you put a deposit down on a puppy. Don’t be fooled! I can.t stress this enough. DO YOUR HOMEWORK!! 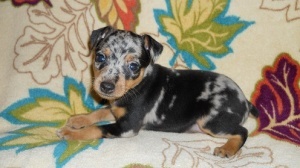 ADVOID any Harlequin Pinscher puppy not HARLEQUIN PINSCHER ASSOCIATION registered (HPA). A Purebred Harlequin Pinscher must be HPA registered. There is no other registry. If the breeder claims to have AKC, CKC, UKC or any other registered pups, they are crossbreeds. NOT Harlequin Pinschers!! ADVOID purchasing a puppy from Breeders who have defective pups in their litters. Alopecia, cleft palllets, twisted spines, underbites, overbites are all genetic defects. The new soon-to-be implemented DNA and genetic testing will help keep our breed and it’s Breeders as the best there is. ADVOID Breeders that are NOT in good standings with the HPA or can not prove their dogs lineages. All Breeders should be able to produce lineage documentations (pedigrees) to prove their Harlie lines back to the foundation dogs. Pedigrees are very important to Ethical Breeders. Ethical Breeders use the Pedigrees to produce the BEST and the Healthiest puppies they can produce. 1. Make sure you are prepared mentally, physically, emotionally and financially about purchasing a puppy before contacting us. 1. We are straight-forward on information and answer all questions to the best of our ability. 2. We do offer an option to be placed on a Priority or Regular Waiting list before a litter is whelped. This gives busy families the comfort of knowing they will be contacted when a litter is whelped and will have first option for pups before they are placed available on the website. Priority list– To be placed on this list a deposit of at least $100 must be received BEFORE the puppies are born. Families that are placed on this list have the option to pick from litters when they arrive in the order as they are placed on the list. (first inquiry with deposit gets first choice, second inquiry with deposit gets second choice and so forth). Regular list– Families that are placed on this list have the option to pick from litters when they arrive in the order as they are placed on the list after the families on the priority list have chosen their puppy. (first inquiry gets first choice, second inquiry gets second choice and so forth). 3. 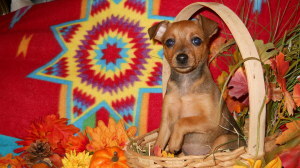 Deposits of at least $200 are accepted to hold the puppy of your choice until it is ready to go. Puppies must be paid in full by the time it is 8 weeks old. Unless other arrangements are made. 4. Delay in making the determination and deposit/payment of the puppy of your choice, could result in it being sold to another party. 5. We will hold a puppy without a deposit if buyer is in-route to pick up or has made prior arrangements for us to hold animal for no more than 48 hours. 6. We do respond to all emails, phone calls and text messages. We have found that texting is easier since we have our phones with us most of the time. Emails and phone calls will be answered or returned in a timely manner. 1. To purchase a puppy , payment is required in full including shipping and delivery fees by the time it is 8 wks old. Unless other arrangements are made between buyer and seller. 2. Deposits/Payments are accepted through WALMART-WALMART transfer, personal/cashier check, pay pa or Postal money order. Postal Money order, cashier/personal check are only accepted if 15 days before delivery, pickup or shipping. Cash only at pickup. 1. I prefer to meet in a safe public area rather than from my home. We no longer live in a society where it is safe or even remotely realistic to allow strangers to come to our homes. A lot of folks have lost their lives by allowing strangers into their homes. I prefer to keep myself and my family safe and will meet a puppy buyer in a well-lit place with others around to help deter getting hurt or killed. How many of you would actually open your door to a stranger and allow them full access to your home? ​My guess is ‘not many’! We will gladly meet a buyer within a short distance to purchase a puppy for those having to make long trips for a small fee. Generally we go as far north as Little Rock, AR. West as Texarkana, AR/TX. South as Monroe, LA and East as Clarksville or Jackson, MS. Please inquire about other areas. 2. We require meeting to take place within 48 hours, and agree upon a mutual date, time and place to meet. If our schedule allows we will also drive further distances to meet buyer. 3. Airline shipment can be arranged at buyers expense. Animals must be at least 8 weeks of age and weigh 2 pounds. We use United Airlines Pet Safe Program or Delta Pet First out of Little Rock, Arkansas. Any other preferred airline may be used but buyer must make arrangements. Animals will only be shipped via airline when it it safe for them to travel. Animals will not be shipped if there is potential extreme hot/cold temperatures or weather conditions at shipping or receiving airline terminals. Shipping prices varies from time to time and will be determined at time of sale. Full sale price of animal and fees must be received 15 days prior to shipment. 4. Ground transportation is available at buyers expense. Usually $350-$700. We have used several ground transports in the past with great success. Transport company may vary depending on availability. Buyer may make arrangements. Animals must be paid in full sale price of animal and fees must be received 15 days prior to shipment.